Verify.Wiki's crowd-sourced research and verification has proven that WhatsApp messages that lead to several killings of innocent civilians in India to be unverified and false. 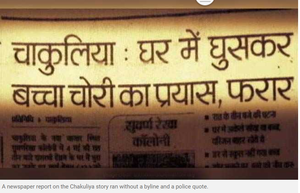 The original story appeared in Jharkhand newspapers based on unverified sources   . The story was then twisted in many states that lead to local mobs killing civilians. By June 2018, the 'Jharkhand Model' would see nearly 30 dead and over 200 arrested in 18 acts of violence in 11 states in India.